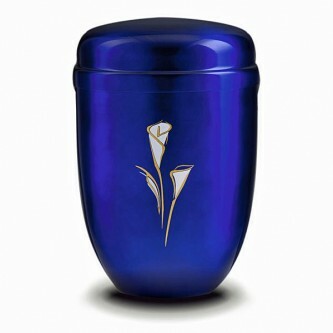 "I HAVE ALREADY BOUGHT A TEAR MINI URN FOR MY HUSBANDS ASHES .WHAT CAN I SAY IT IS BEAUTIFUL,I BOUGHT IT FOR MY MOTHERINLAW FOR HER KEEPSAKE.IN TEN MONTHS SHE HAS LOST ANOTHER SON SO HAVE BOUGHT ANOTHER ONE FOR HER .GREAT COMPANY WELL MADE GOODS ." This is the Devotion Cremation Urn, it is a large, or adult sized steel funeral urn of the very highest quality. This beautiful craftsman made ashes urn has been finished with the most amazing artwork, and has a depth and quality to the finish that makes these urns for ashes unbelievably precious and superb value. It really is a fitting testimony to the memory of a loved one.